Since the launch of the Supacat HMT Light Weight Recovery (HMT LWR) vehicle at DSEi in September 2017 the prototype vehicle has been undergoing trials both by Supacat at its test facility and by CSS TDU (Combat Service Support Trials & Development Unit). The trials have identified areas with potential for further capability gains and enhancement to the original specification. The next phase of development trials will start in October 2018 and will continue throughout 2019. 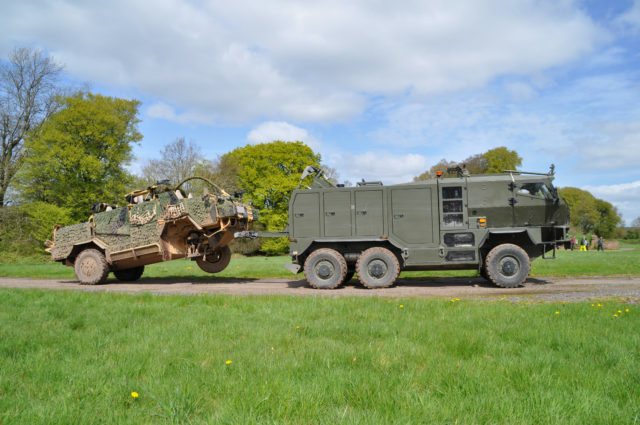 The 10.5 tonne HMT Light Weight Recovery (HMT LWR) has been developed to fill a capability gap to recover vehicles operating in hard to access urban and rural locations as required by the UK MoD’s Light Weight (Air Portable) Recovery Capability (LW(AP)RC) programme. HMT LWR utilises an innovative new Supacat designed technology, `Supalift` (patent pending), which increases the size of vehicles that can be recovered by a light weight recovery vehicle. HMT LWR’s recovery system can be operated both in conventional mode and by the operator engaging `Supalift`, which increases the maximum lifting weight of the recovery system by up to 50%. In conventional mode the HMT LWR recovery system lifts a maximum recovered vehicle axle mass of 3.8 tonnes and in `Supalift` mode rises to 6.1 tonnes (specification based on recovering an HMT 400 `Jackal 2`). `Supalift` technology is based on the principle of distributing the weight of the casualty vehicle more evenly over the recovery vehicle.